Headed to Minneapolis or St. Paul by plane in the near future? Don’t forget to look out the window—Kansas landscape artist Stan Herd recently completed a stunning large-scale rendition of a Vincent Van Gogh painting that can only be truly enjoyed from above for a limited time. 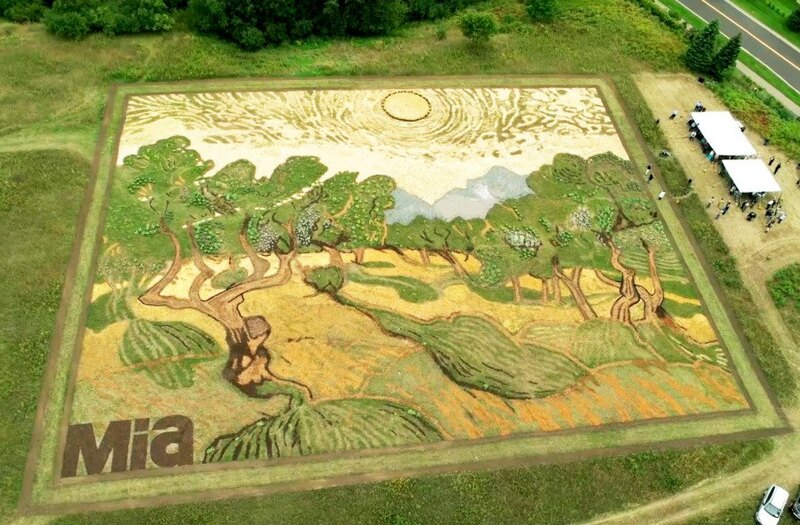 The spectacular and ephemeral land art interpretation of Van Gogh’s 1889 painting “Olive Trees” is made from native plants and was commissioned by the Minneapolis Institute of Arts for their 100th anniversary celebration. Herd’s impressive crop-art interpretation covers an area of 1.2 acres on Thomson Reuters’ 300-acre campus near the Minneapolis-St. Paul International Airport in Eagen. While impressive, this commemorative piece is far from Herd’s largest land art portrait. Herd, 64, has been sculpting the earth and working with plants since his first 160-acre portrait of the Kiowa Indian Chief, Satanta, that was sculpted into a Kansas prairie in 1970 and took four years to complete. Herd has since worked throughout the U.S. and internationally to create similar large-scale art projects in countries from Australia to Cuba. In his recreation of Van Gogh’s “Olive Trees,” Herd began planting in the springtime, carefully selecting everything from the mulch to the types of plants needed to create the desired effect. The earthwork process included processes such as rototilling a frame to define the edges, mowing the grasses into the desired length and texture, and digging furrows in particular areas to create shadows and outlines of specific features such as tree trunks. Van Gogh’s signature dazzling painted sky was recreated using a field of oats mowed in concentric circles. Like many of his artworks, Herd’s rendition of Van Gogh’s painting will disappear over time as the crops grow out and elements wear down the design. The field location was specifically chosen so that flight passengers can easily see the land art (travelers will want to sit on the left if they’re landing from the southeast and flying to the northwest). Visitors can see Van Gogh’s original “Olive Trees” painting at the Minneapolis Institute of Arts. In his recreation of Van Gogh’s “Olive Trees,” Herd began planting in the springtime, carefully selecting everything from the mulch to the types of plants needed to create the desired effect. Herd’s impressive crop-art interpretation covers an area of 1.2 acres on Thomson Reuters’ 300-acre campus near the Minneapolis-St. Paul International Airport in Eagen. 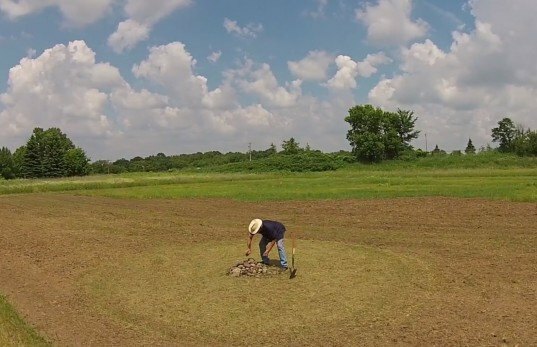 The earthwork process included processes such as rototilling a frame to define the edges, mowing the grasses into the desired length and texture, and digging furrows in particular areas to create shadows and outlines of specific features such as tree trunks. Van Gogh’s signature dazzling painted sky was recreated using a field of oats mowed in concentric circles. A close up of the sky in Van Gogh's Olive Trees painting. Like many of his artworks, Herd’s rendition of Van Gogh’s painting will disappear over time as the crops grow out and elements wear down the design. The field location was specifically chosen so that flight passengers can easily see the land art (travelers will want to sit on the left if they’re landing from the southeast and flying to the northwest). Image of Van Gogh's Olive Trees painting overlaid with a grid. Van Gogh is one of Herd's favorite artists.